So this is the academic year in which myself and my cohort turn 30. Where has the time gone? The search for “special” gifts begins for those I am close to. Presents are hard to choose every year but this year I feel the pressure is on to give something that little bit more special. I thought long and hard and decided that putting my own time and patience into a gift would provide a personal touch and result in a unique gift. Nothing leant itself better to this than free form machine embroidery. I purchased some calico for a plain background, some beautiful floral and spotted cotton and the correct foot for my machine. 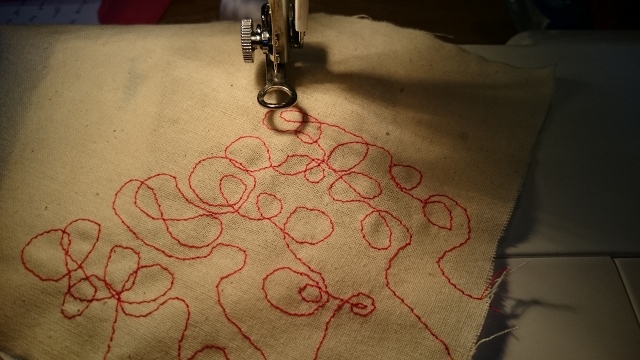 I threaded the machine with a high contrast red and set about creating a random pattern on one corner of the calico. This was the first time I had used this technique but had read up well. Working with the feed dogs lowered took some getting used to and at first I still wanted to turn the fabric. 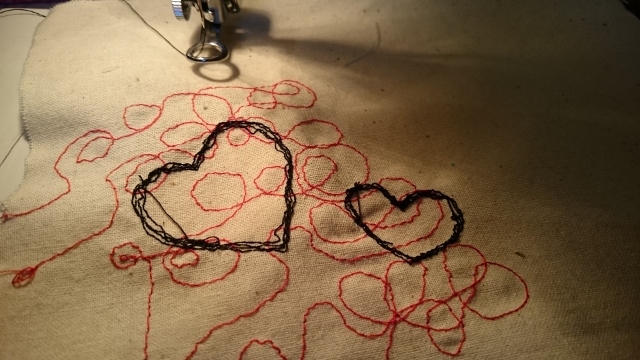 Once satisfied with the random pattern I used the machine to sew two red hearts onto the calico again using a contrasting thread, this time black. 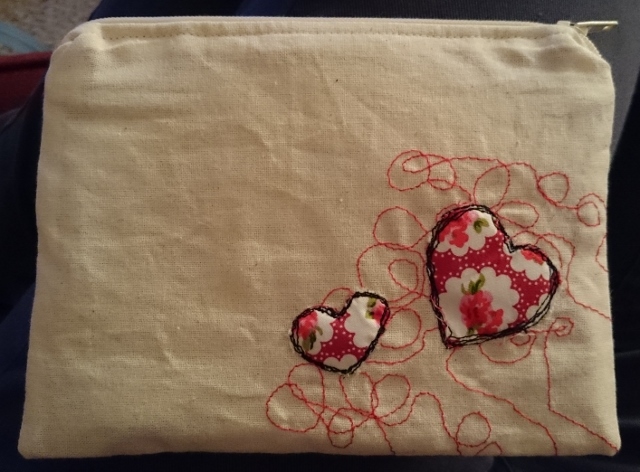 Here, on the reverse of the fabric, you can clearly see that I went around the hearts several times to create a rustic feel, and to make sure that the fabric was caught well so not to fray. Then I needed to make it into something useful. I decided a little purse, lined with red cotton with white polka dots, would fit the bill. Now to decide what to make for the next birthday!